1Lt Edwin H. Assenheimer (P) - Missions: 1st #80 (3 Nov 43) 34th #180 (14 June 44). Flew first 10 missions as a CoPilot with Lt LeRoy E. Daub (6), Lt Elmer W. Young & Lt Billy M. Goolsby (2). Upgraded to Pilot on 16 March 1944 and flew 24 missions as a Pilot. 2Lt Joseph C. Sassone (CP) - Missions: 1st #92 (24 Dec 43) 34th #164 (29 May 1944). Flew as CoPilot with 11 Pilots - Young (4), Daub (3), Eisenhart (4), Goolsby (5), Stoulil (1), Blossom (2), Hybert (1), Dahleen (1), Marsh (1), Newell (1), Assenheimer (10 - #126-127-128-129-130-131-139-141-144 & 164). S/Sgt Charles G. Covington (WG) - Missions: 1st #88 (13 Dec 43); 30th - #151 (5 Nov 44). Lt Assenheimer Missions: Three (#141,142 & 144) 1st 25 missions as Tail Gunner with the Lt Howard D. Dahleen Crew. Sgt Wayne E. Meir (Tog) - Missions: 1st #13 (22 Apr 44); 33rd - #214 (29 July 44) Lt Assenheimer missions: 1st Fifteen between 22 April and 06 June 1944. Then flew eighteen missions with seven different Pilots. S/Sgt Robert A. Rettinhouse (WG)(WIA) - Missions: 1st #35 (14 May 43) 31st - #169 (03 June 44). Lt Assenheimer missions - Last eleven missions #136 (18 Apr 44) to #169 (03 June 44). First fifteen missions with the 1Lt Robert L. Mattison Crew - #35 (14 May 43) to # 51 (17 July 43) Badly wounded on mission #51 (17 July 43) to Hannover, Germany, 1Lt Mattison, Pilot. Spent five months in three different Hospitals. Resumed missions on 03 February 1944. Flew five missions with four different Pilots before his assignment to the Assenheimer Crew as Waist and Tail Gunner. T/Sgt Lloyd C. Mouser (R) - Missions: 1st #72 (27 Sept 43) 31st #153 (13 May 44). First 19 missions through #129 (27 Mar 44) with six different Pilots - Hanselmann (2), Campbell (2), Bolsover (6), Quinn (2), Shoup (1) & Eisenhart (6). 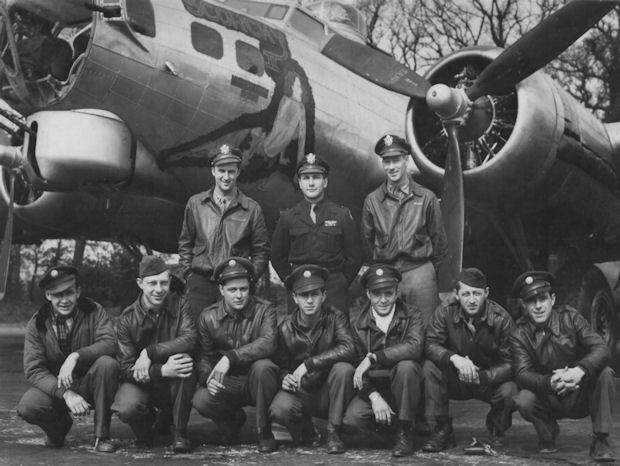 Assigned to Assenheimer Crew mission #126 (23 Mar 44) and flew his remaining 12 missions with this crew.